Doe ETF's have an achilles heel?, Diversified on index but dependent on bank? While reading something entirely unrelated, I came across this chart. 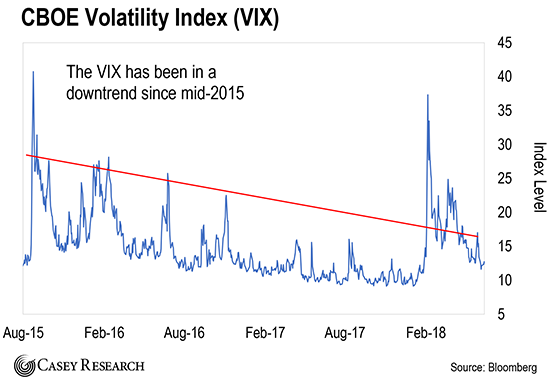 As can be seen, the Vix has been in a steadily downward path from its highs of 53 in Aug 2015 until it got below 10 in late 2017. Since then its all uphill.We have had intraday highs of 36 in late december. Morningstar estimates that some time in 2019, the percentage of assets held by exchange-traded funds in the US Ã¢â‚¬â€œ those index-hugging passive vehicles Ã¢â‚¬â€œ will break through the 50 per cent barrier from their current level of about 48 per cent. The research firm says through the first 11 months of last year, US investors pulled an estimated $US150 billion from actively run funds across asset different classes, excluding money markets. In contrast, they added $US395 billion to passive funds, according to Morningstar. - or, as ETFs grew, volatility did, as well. Expect tears. A new artificial intelligence-powered exchange-traded fund launched on October 18. Called the AI Powered Equity ETF (ticker: AIEQ), it uses IBM's Watson supercomputing technology to analyze more data than humanly possible, all in the pursuit of building the perfect portfolio of 30 to 70 stocks. The ETF ranks investments based on their "probability of benefiting from current economic conditions, trends, and world- and company-specific events" and picks those with the best chance at outperformance, according to a recent release. - no longer an Achilles heel, but bringing the market to heel? "As powerful as many algorithms underlying expensive quantitative hedge funds and other vehicles might be, unless they're also built with AI and machine learning baked right in, mistakes can be propogated and opportunities for outperformance can be missed," he said.. The conundrum for most private investors is that government bonds often offer lower returns than cash, corporate bonds are more lucrative but very few people have the time or money to construct portfolios in this area as most corporate bonds are sold with a $50,000 minimum. ETFs on the other hand can offer that most elusive criteria Ã¢â‚¬â€ a diversified holding in true fixed income. If there is a flaw in the argument itÃ¢â‚¬â„¢s that bond ETFs being listed on the ASX means they can be sold off easily should investors see reason to panic ... and thatÃ¢â‚¬â„¢s just what tends to happen. BetaShares is poised to launch a hybrid security investment vehicle following its .. cash and fixed interest offerings. BetaShares has appointed Coolabah Capital Investments under an institutional mandate to operate the actively managed vehicle that looks to reduce the risks involved in holding the popular half-debt, half equity instruments according to BetaShares managing director Alex Vynokur. "Hybrids are significantly less risky than equity but they are much more risky than bank deposits for example. What we are bringing to the table is an actively managed solution that will help an investor diversify and minimise downside risk," Mr Vynokur said. The fund will also allow investors with significant hybrid holdings to make in-specie transfers into the fund in order to minimise the tax implications and will consider acquiring hybrid holdings of more than $500,000. There are more than $50 billion of hybrid securities on issue in Australia with the vast bulk of them purchased by retail investors and SMSFs who are attracted to the higher rates of income they offer. Around 80 per cent of these securities have been issued by the banks. The new fund will round out BetaShares' suite of popular fixed-income offerings that include the High Interest Cash ETF (AAA), which has attracted $1.27 billion in investor in just five years. The firm's newly launched senior floating rate note ETF (QPON) has attracted $100 million in flows in the first three months. BetaShares says that hybrids are an attractive if tricky asset. They are about five times less volatile than equities but about six times more volatile than floating rate notes. The fund will pay monthly franked income and charge 45 basis points per annum plus cost recovery to a maximum of 10 basis points. It will also charge a performance fee equal to 15 per cent of outperformance subject to a high watermark. BetaShares says the manager will have the ability to roam across the capital structure and move into subordinated debt, senior debt and cash when appropriate. It will have the flexibility to move into 100 per cent cash. The firm believes that self-directed investors who have been compelled to buy hybrids but are unable to manage a portfolio will be attracted by the offer. "Hybrids can be complex instruments. Some of them have non-viability clauses and capital triggers. It's an asset class that really lends itself to asset management," Mr Vynokur. plus brokerage... getting expensive. In my view, they then take risks, (manager discretion) to bump up the yield! A new ETF likely to attract fund flows will be a fund focused on the world of robotics, automation and artificial intelligence. The robotics industry, which had an estimated value of $64 billion in 2015, is expected to be worth as much as $1.2 trillion in 2025. It will be pitched as an inexpensive and fully diversified option over a growing mega trend. Unlike Magellan, which has selectively invested in these themes across household names like Google, Apple, Alphabet, Microsoft and Facebook Ã¢â‚¬â€œ ETF Securities will look for emerging names in the sector. The fund will target earnings per share growth that is at least twice that of the S&P 500. The fund is expected to have as many as 80 constituents with 20 companies accounting for 2 per cent each and the remaining 60 companies accounting for 1 per cent each for the purposes of diversification and the higher risk nature of the investments. The investment universe is less intuitive that its companion fund (an Infrastructure ETF) and will involve companies selected by a panel and then put through a quantitative screen which will take into account the company's home exchange, trading volumes and market capitalisation. Constituents will be required to generate a material proportion of earnings from either robotics, automation or artificial intelligence. ...........A market that is just systematic (non-diversifiable) risk is impossible to trade. You can be risk-on (long stocks), or risk-off (short stocks), but there are virtually no benefits to diversification. Look at S&P 500 index funds. In the old days, you would say you were diversified if you owned an index fund Ã¢â‚¬â€you owned 500 stocks! "If everybody indexed, the only word you could use is chaos, catastrophe," Jack Bogle, the founder of Vanguard Group, said in an interview with Yahoo! Finance on Saturday. "There would be no trading, there would be no way to convert a stream of income into a pile of capital or a pile of capital into a stream of income. The markets would fail." .... Passive equity investments may become as much as 45 percent of the mutual fund industry within five years as investors move to low-cost funds, Bogle said in an interview on Bloomberg Radio in March. It's now between 20 percent and 40 percent, Bogle said on Saturday, and could reach 75 percent without posing a significant market risk. He distinguished ETFs from other funds that track the indexes, saying that investors in those products don't maintain the same "buy and hold" mentality. provided for EB when he said, elsewhere, ....i thought one need much more work to understand macro economic to play index and major weighing stocks movement... not sure it is a good idea for people to "invest in index"
the case for a qualitative overlay on indices built with quantitative inputs received a boost from Hong Kong last week when the governance shortcomings of Huishan Dairy were revealed. On Tuesday, the Chinese company, whose shares inexplicably plummeted 90 per cent (in just an hour) a few days before, confirmed it was in financial difficulty. The milk group also said most of its largest investor's shares had been pledged for loans. Trading was halted days before the news came out. End investors will unwittingly hold the stock through tracker funds. Huishan is a constituent of the MSCI Asia Pacific index. Holders include BlackRock, Vanguard and Invesco, according to Bloomberg data. Worse, Huishan is also in the MSCI Emerging Markets ESG (environmental, social and governance) index. That looks odd, given the rumours circulating about executives. A March 2015 report from MSCI ESG Research highlighted aggressive accounting practices. Exchange traded funds are far from being the elephant in the room. Rather than ignoring these ever more popular securities, the Securities and Exchange Commission is reportedly preparing to launch an in-depth review of them. Given their growing importance, this is welcome. A big worry is that liquidity in ETFs is deceptive, especially when a fund tracks less liquid assets, such as bonds or emerging markets stocks. So-called authorised participants (often investment banks) try to match buyers of ETFs with sellers in the secondary market. In the absence of a match they can ask the ETF provider to issue new shares in exchange for a basket of the (less liquid) underlying securities Ã¢â‚¬â€œ or take units back in return for assets. The existence of these market makers is what enables ETFs to offer live pricing, and should ensure liquidity. A run on an open-ended mutual fund can also cause big dislocations in the securities it owns, since it must sell assets in order to repay investors. Witness the closure of a high-yield US bond fund in 2015, or recent problems at British commercial property funds. A closed-end fund does not sell assets, but its share price can diverge significantly from the value of its holdings. In this sense, ETF liquidity is arguably better than either. ETF assets under management have grown almost 20 per cent per year, and stand at $US3.3 trillion ($A4.3 trillion) globally. No end is in sight to this expansion. With figures so big the details matter. The SEC has limited the use of leverage and strengthened minimum cash requirements. More such rules will help, not hinder, the market's growth.